Want to save money on feeding your chickens? Here’s how to feed chickens without breaking the bank. Growing chicken feed right in your backyard is easy — plant a chicken garden! Someone gifted me a book years ago about free range chicken gardens. It was a beautiful book, full of photos of beautiful gardens. And it was the biggest bunch of nonsense I’d read about chickens in awhile. Don’t get me wrong. I love my chickens. I love the idea of free ranging chickens. But I can tell you from lots of experience that you cannot maintain a beautiful garden with chickens wandering loose. They poop. They scratch and tear things up. And they’ll eat every last bit of your veggie garden if given the opportunity. I don’t recommend giving your girls free rein if you’re trying to maintain a pretty garden space. 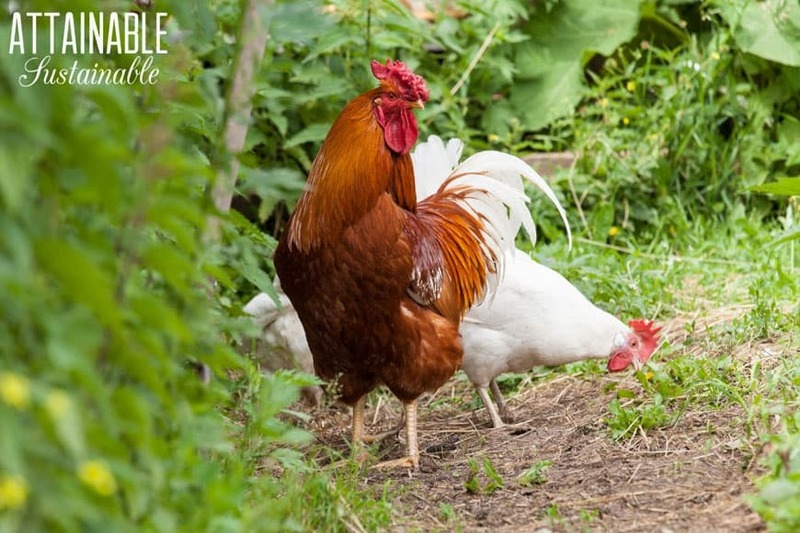 But you can still provide your hens with plenty of fresh “forage” by planting a chicken garden to grow some organic feed for your hens. Not only does a chicken garden prevent last minute trips to the feed store to restock on organic feed and crumbles, it allows you to lower your feed costs by growing some of what your girls eat, right there in your garden. Think about it. Say you can pick up a packet of seeds for $3 and that packet contains 30 seeds. That’s ten cents per seed. Depending on the crop, that ten-cent investment could net you many pounds of produce grown on site. 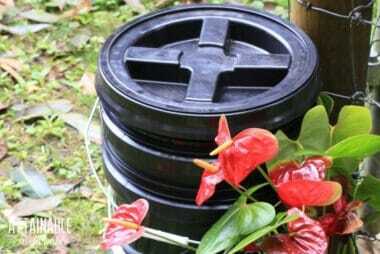 Assuming you’ve got space to plant a little extra for your feathered friends, growing your own DIY chicken feed makes so much sense. Related: Do You Need Supplemental Lights in the Henhouse? Greens are great for supplementing a chicken’s diet. Lettuce is a favorite for my girls, and it grows well here so I always seem to have excess. It makes them happy. If you’ve got more radish greens than you need for this recipe, the girls will happily help you eat the rest! 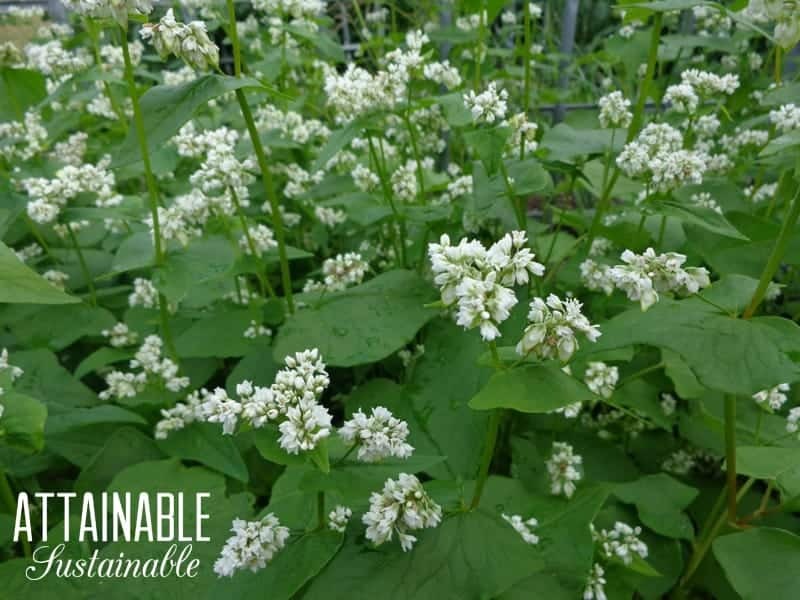 Buckwheat is a great “bee plant” to have growing in your chicken garden, and my chickens love the greens as well as the seeds. A head of cabbage is both food and entertainment, especially if you create a cabbage piñata. Kale starts out looking like many greens—lots of leaves—but as you harvest the outer leaves the plant grows taller and taller. A single kale plant can produce leaves for months. Greens like spinach, bok choy, and Swiss chard are all fair game and if you use this technique, you’ll be able to harvest for weeks or months. Individual leaves can be hard for hens to tear, though. How to feed chickens these greens so they can eat them easily? Try using a suet basket to serve them up. While some people consider it a weed, purslane is a great addition to your chicken feeing plan. And a great addition to your dinner table! 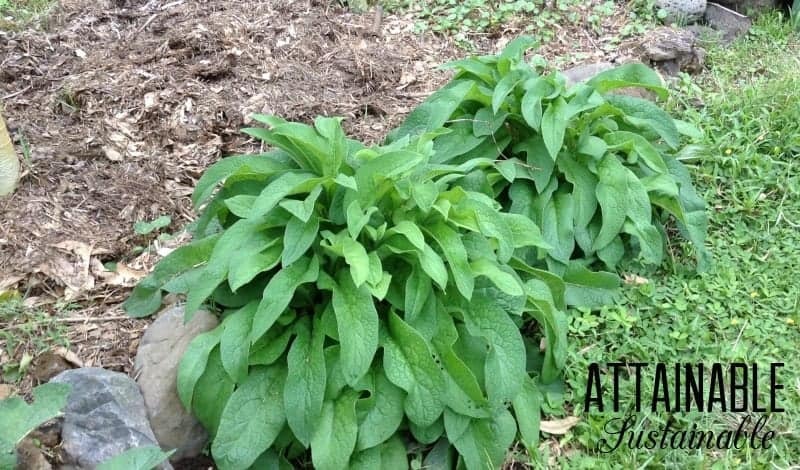 Comfrey is a garden perennial that has a lot of uses medicinally, plus it’s pretty. My girls love it. (In fact, when I divide comfrey, I’ll often toss the entire root ball into their enclosure. They eat the greens and scratch away the dirt and bugs, then I can easily divide it.) Concerns have been raised about feeding comfrey to chickens, but I’ve not had any problems. If you live in a climate that’s warm enough for perennial peanut grass, consider planting some in the area where your chickens roam. While they don’t eat the green leaves down, they love the yellow flowers. Sunflowers add a happy face to gardens all summer long. 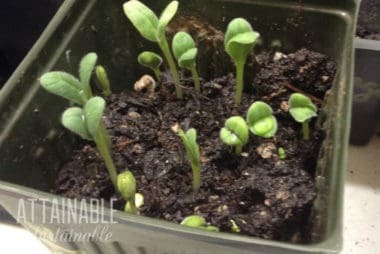 How to feed chickens sunflower seeds: When the sunflower seeds themselves are mature, cut off the entire flower and let your chickens have at it. You can store extra flower heads in a cool, dry place to dole out during winter months. For something a little bit different, try growing amaranth in your chicken garden. The seed heads will get heavy with seeds that the chickens love, and it’s good at reseeding itself in a lot of regions. The greens are edible, too. Sorghum grows much like corn. The stalks are used for making a sweetener. The grains are used to make sorghum flour, a gluten-free ingredient in baking. Your chickens will eat the grains straight off the plant. Here’s more about growing grain. Tomatoes will produce fruit for months during the warm season. Cracked tomatoes, buggy tomatoes—or even extra tomatoes if you’re willing to share—will be devoured by your girls. If you’re successful with melons you can toss one to the chickens once in awhile. They definitely don’t mind the overripe melons that your family turns their nose up at. My girls love garden peas. They prefer it if I shell the peas for them first, though, so it’s not something I offer regularly. Consider planting a crabapple tree in your chicken run. Even ornamental crabapple trees that produce small fruit that you might not bother with will be appreciated by your hens. I think I read that same book. The person who recommended it to me said, “Well, you just have to plant enough.” Really? I have 50 chickens there and they can easily eat up my 1/4 acre garden. But we do grow things for the chickens and do let them free range when we are outside (we have new dogs who are still being trained). Yesterday they go a wheelbarrow full of broccoli that was flowering. They loved it. 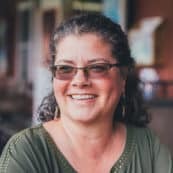 I love this post Kris! Such a great idea. We grow sunflowers for our chickens every year. We just cut off the whole flower at the end of the season and toss it into the run. They go nuts for it! I can’t wait until we have more space and can grow more crops just for them. Spoiled hens! We free range our chickens and have a 1/4 acre garden. The girls NEVER go into the garden (it’s not fenced) unless I’m spreading compost or I’ve recently tilled. They have 5 acres of lawn and pasture to forage and prefer bugs to my veggies. That being said they still get beet greens and cabbage and other goodies when we have extra. That blows my mind, because the garden is the FIRST place mine go. Like it’s a buffet put there just for them! My chickens always ate my garden. One of there favorite things to do was to scratch the dirt away from my roses’ roots and take dust baths. I guess even hens want to smell nice, lol. Now that is a great idea. My son has been wanting us flower seeds. In front of there run would be great. Thanks for the spark. Mine love any extra zucchini (who doesn’t have extra zucchini) or other squash or pumpkins. Parsley is good for their respiratory systems and my chickens love it. 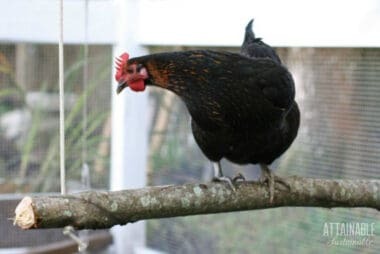 I plant it around their run and I have to put a piece of board or cardboard between the plant and the fencing to keep them from pecking thru the fence to get at it until its fully grown. Then I let them have at it! They love basil too. Oregano and sage, not so much. Oh, interesting. I haven’t tried that one yet. I’ve got some plants here; I’ll test it. Thanks! Great ideas, will start right away! I just had a ton of purslane growing in my garden a few weeks ago and I pulled it all up!! I can’t remember if that was the arm full of weeds that I have to my chickens or not.. Humph..
My chickens love all the veggies and plants. I grow them herbs and lettuce and all sorts of veggies. This year we will plant them some sunflowers. Their favorite is field peas though. We can’t seem to plant them enough! They consume herbs daily and they are so healthy. When our flock has free-range time, the first place they head is to the garden. They absolutely love eating the greens. And if I am not paying attention, they will try to sneak ripe tomatoes. Wheat would be much appreciated, I would think. Bugs, yes! And I find that letting the girls roam, scratch, and peck gives them access to lots of bugs and worms for protein. I saw a pin. That the woman grew a garden just for her chickens and she let the chickens in the garden and they packed at the plants where ever she had. And it was really a lot of fun. Would you plant a garden next to the coop to just let the chickens roam the garden at will? As long as the chickens are only in it for short times, it would be great. If they have constant access, they’ll trash it quickly. I always thought that chickens are not allowed to have tomatoes (same nightshade family as potatoes)? They shouldn’t eat tomato leaves, but no problem with the fruit.